One Of The Biggest Spenders Has Been The PAC Of Gov. Rick Snyder, Who Signed A Law On ‘Independent’ Campaign Spending Last Fall. LANSING (APRIL 20, 2018) — Earlier this year, two of the top state officeholders in Michigan met inside an insurance company. In front of large glass windows, Gov. Rick Snyder stood by his running mate, Lt. Gov. Brian Calley, who’s now a candidate to be the state’s next governor. They walked down the hall. Cameras rolled. Footage of Calley and Snyder inside the Jackson National Life building has made its way into TV advertisements being aired by multiple groups this spring. 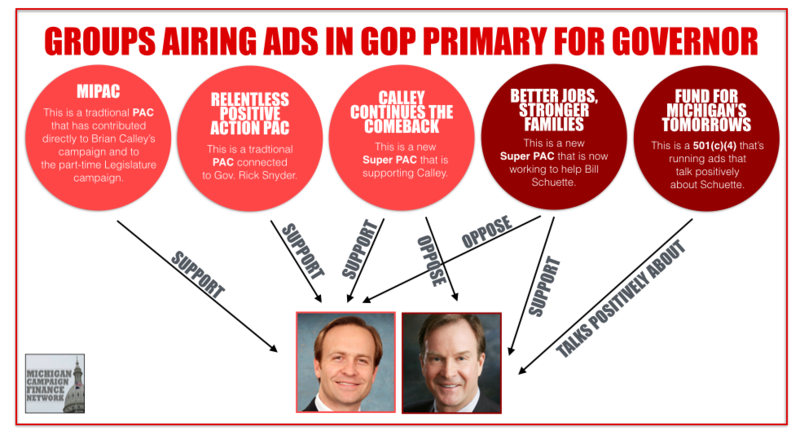 The groups are supposed to be acting independently of Calley, but Calley himself appears in the ads. Less than eight months after Gov. Snyder signed a bill establishing new standards for how closely candidates can work with “independent” spenders looking to sway voters, multiple PACs with connections to Calley have bought ad time to boost his campaign. One of the PACs is Snyder’s own, the Relentless Positive Action PAC. The PAC’s biography on Twitter says Snyder, under whom Calley currently serves as lieutenant governor, created the PAC. According to the Michigan Campaign Finance Network’s analysis of Kantar Media/CMAG ad-tracking data and of Federal Communications Commission filings, the PAC has spent more on broadcast TV ads in Michigan than any other PAC this year as of April 16, an estimated $236,000 total. 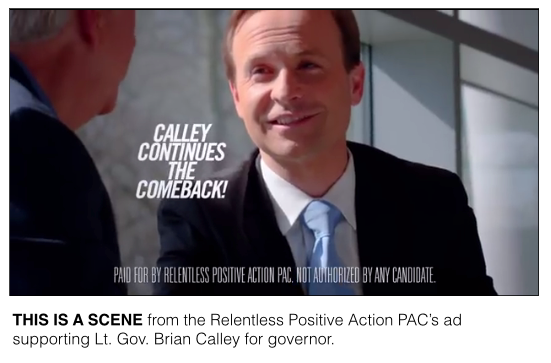 The Relentless Positive Action PAC’s ads feature Snyder saying Calley “must be the next governor” and footage of Calley and Snyder together inside Jackson National Life. That footage was filmed earlier this year, as confirmed by the PAC’s record keeper, Amanda Kornegay. She said the Jackson National Life building was featured in the ad because the company is part of Michigan’s comeback. “Highlighting that gorgeous building was a nice addition,” she said. But the ad, which so prominently features Calley, has raised eyebrows among a handful of sources from both sides of the aisle. Some have privately questioned how the ad fits with the new law that says candidates cannot work in “cooperation” or “concert” with groups that make independent expenditures. The Relentless Positive Action PAC hasn’t officially disclosed the ads as independent expenditures yet (the next campaign finance disclosure deadline is April 25). But because Snyder endorses Calley in the ad and because of the spending level — a PAC can only give $68,000 directly to a candidate — it would seem the PAC likely considers them independent expenditures. The PAC’s ads began airing on broadcast TV on March 23, according to MCFN's tracking, two days after Snyder formally endorsed Calley at a public event in Southfield. The same day the ads debuted on broadcast TV, March 23, Tricia Kinley, external affairs director for Snyder, sent out an email inviting people to a March 28 fundraiser for Calley’s gubernatorial campaign, according to a document obtained by MCFN. “On behalf of the governor — we would love to have you attend! Checks are encouraged and welcome but even a stop-by show of support to the LG would be appreciated," Kinley’s email said. While Snyder is helping Calley raise money for his campaign, he also appears to be using his PAC to help Calley independently. Some donors are giving to both the PAC and the candidate. For instance, Mark Jones, an executive with Amerifirst Home Mortgage, has given $6,800, the maximum an individual can give a candidate for governor, to Calley’s campaign. He also gave $10,000 to Snyder’s PAC on July 13, according to campaign finance filings. William Parfet, former chairman and CEO of MPI Research, has given $6,800, to Calley’s campaign. He gave $100,000 to Snyder’s PAC on Dec. 6. Parfet has also been among the top donors to MIPAC, which started airing ads on cable this week in support of Calley. Parfet has given $100,000 to MIPAC since the start of 2017, according to campaign finance disclosures. MIPAC has given $31,800 directly to Calley’s campaign for governor, and it’s made about $301,000 in in-kind contributions to support the part-time Legislature ballot proposal, which Calley was championing in 2017, according to campaign finance disclosures. So far, MCFN has tracked an estimated $40,000 in cable ad orders from MIPAC, according to federal disclosures. But the overall order could be higher because cable ads are difficult to track through federal disclosures. According to his campaign finance filings, before April 12, MIPAC’s treasurer was listed as Michael Stroud, who worked as an employee in the lieutenant governor’s office until November 2015. On April 12, the PAC officially changed its treasurer. The PAC’s ads began running about five days later on or about April 17. Stroud said in an email, that he actually resigned as the PAC’s treasurer on April 6. He also confirmed that he is an independent contractor for the Calley campaign. However, he said he had never communicated any information to the PAC regarding the Calley campaign. After multiple court decisions altered campaign finance regulations nationally, Snyder signed a bill in September 2017 that supporters said would update Michigan’s laws to better fit with the legal rulings. The new law focuses on the subject of independent expenditures. While candidates face strict limits on how much money they can take from donors, groups acting “independently” of the candidates have been able and continue to be able to raise and spend unlimited amounts. The new law stipulates that candidates can solicit contributions for independent Super PACs and that candidates and independent spenders can share certain consultants, as long as the consultants don’t convey information about campaign plans. But the new law also changed the definition of an independent expenditure, shifting it from an expenditure not made under the direction of a candidate to an expenditure not made “in cooperation, consultation or concert with” a candidate, a standard that could be tougher. At the federal level, there’s been debate about how footage of candidates fits into spending that’s supposed to be “independent.” The Federal Election Commission has previously decided that the use of the same footage by both a candidate and an independent spender doesn’t necessarily mean the spender improperly coordinated with the candidate on the ad purchase or the overall message of the ad. But to avoid coordination risks, campaigns have posted raw footage online in order to allow outside groups to find and to use in their ads. Similarly, Super PACs that supported GOP presidential candidates Jeb Bush and John Kasich in 2016 filmed Bush and Kasich before they officially became candidates in order to not coordinate with candidates, according to a Washington Post report. But there are no guarantees about how the Michigan Secretary of State, who regulates campaign finance disclosure in the state, will interpret the state’s new law. In 2014, there were allegations here that a nonprofit group had coordinated with candidates for the state Senate when one of its vendors filmed two candidates. But the Secretary of State didn’t end up ruling on the question. That’s because a conciliation agreement, which focused on other issues, was reached in which the group agreed to pay a penalty instead of the matter being taken further. The 2018 election will be the first to take place under the state’s new campaign finance law. So far, at least four PACs have appeared to make independent expenditures in the race for governor. Three have supported Calley or opposed Calley’s GOP primary opponent, Attorney General Bill Schuette. The other PAC has been working to benefit Schuette. The biggest spender among them has been the Relentless Positive Action PAC. MCFN has tracked an estimated $298,000 in spending on broadcast and cable ads by that PAC. MIPAC began airing ads on or about April 17 and has reserved at least an estimated $40,000 in time on cable, but the amount could be higher because cable ads are difficult to track. Calley Continues the Comeback, a Super PAC supporting Calley and opposing Schuette, has aired on cable as well. As for the group supporting Schuette or opposing Calley, Super PAC Better Jobs, Stronger Families, has aired ads on cable and broadcast TV. A nonprofit that isn’t subject to Michigan campaign finance regulation has also been running pro-Schuette ads. The Fund for Michigan’s Tomorrows has aired or reserved an estimated $204,000 in broadcast ads and more on cable, according to MCFN’s analysis of Kantar Media/CMAG ad tracking data. The PACs will have to file campaign finance disclosures on April 25.